For most owners, the sale of a practice represents a lifetime of work and the value locked within forms a significant part of their ultimate retirement fund. Yet too often, when it comes to selling their prize asset, healthcare business owners are reactive, rather than proactive; Planning is either far too late or non-existent and decision making flawed, with owners forgoing the power of market forces and being sucked in to ‘save money’ by going down the “webuyanypractice.com” route and talking exclusively to the first party that approaches them. Pretty much every week, my team and I are contacted by a healthcare business owner who has had their fingers burnt by what seemed initially like a good practice sale option, only in the absence of the right guidance or leverage, for the original sale terms to be chipped away during the course of negotiations to the point where they are practically giving away their business. Alternatively, owners come to us too late having run down their operations to such an extent that they are no longer saleable and have become liabilities to dispose of, rather than assets to sell. 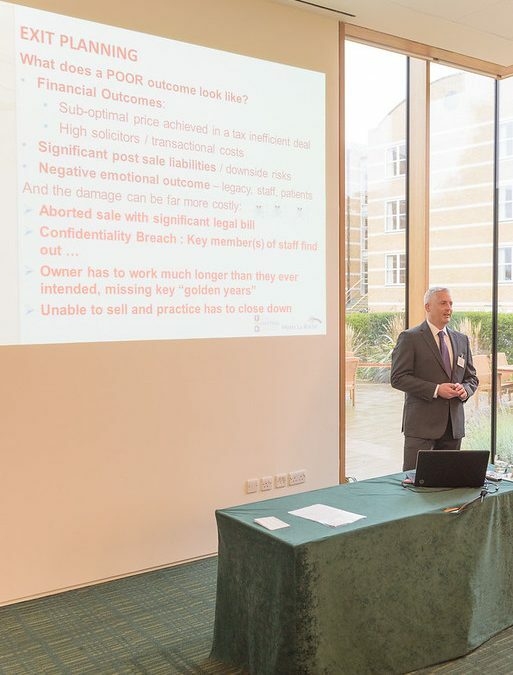 I am always therefore delighted when I get the opportunity to talk on the subject – as I did last week at the Moller Centre, Cambridge – and to articulate to practice owners what a significant difference a bit of forward planning and niche industry-specific guidance can make. As the slide in the photo highlights, failing to prepare your route to market can result in at best a sub-optimal outcome and at worst can be catastrophic.